Are you ready to change your life? 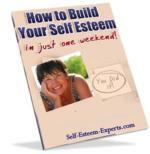 If you answered, Yes, then our Articles on Self Esteem are for you! Our articles are filled with information, self esteem exercises , positive thinking quotes and meditation tips to boost your self esteem and for improving self confidence. Reading and applying what you learn will improve your life and bring you greater happiness, confidence and peace. You'll change from being a victim of circumstances to being a creator of your destiny. and 90% of how I react to it. You can feel better and live a happier more satisfied life, no matter what your circumstances when you become aware of your current thinking and practice using the self esteem activities and exercises to transform your thoughts and behaviors. Feel free to reprint our articles as long as you include the active links in the articles and the following copyright information. Copyright 2011 Joan Breiner, M.Ed. & Susyn Reeve, M.Ed are the creators of Self Esteem Experts providing information, exercises, worksheets and meditations to boost self esteem, build self confidence and increase happiness. All rights reserved. Please send us a note at Support@SelfEsteemExperts.com when you reprint our articles, so we can be sure to thank you! What is the Connection Between Depression and Food?